Are you in need of iPad repair in Baltimore, MD or the surrounding area? Whether you live in Baltimore, Columbia, Towson, Glen Burnie, Annapolis, or any of the surrounding cities, you can get your Apple device repaired ASAP. Keep reading this page to learn how to get fast, affordable service for your iPad today. Want to get service from an Apple Authorized Service Provider right away? Students, working professionals, and recreational users all rely on the Apple iPad. It’s easy to see why many of the common problems that users face can cause aggravation. 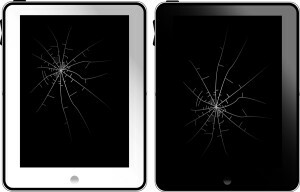 A Cracked Screen – You might have dropped your iPad, or unintentionally put too much weight on it. Either way, the screen is cracked and it’s hindering your ability to work. Fortunately, the screen can be replaced with a brand new one so it will be as though the crack in the screen was never there. A Broken Headphone Jack – Not having audio on your device when you have headphones plugged in can be very frustrating, but the task of opening device and taking out the defective headphone jack is something most users don’t know how to do. If this is the kind of iPad repair you need, then leave it to authorized Apple repair to fix the issue. A Faulty Dock Connector – Are you unable to charge your iPad? Or have it sync with your computer? If you face these issues, then it’s very likely that the dock connector is at fault. When this is the case, then the device will have to be opened so that the connector can be replaced with another one. Battery Replacement – Even if your device is in perfect working order, the battery will not be able to hold a charge the way it did when you first got the iPad. When the battery’s storage capacity gets so low that it spends more time on the charger than off of it, you will have to get it replaced with a completely new battery. These are just a few of the reasons why people need Apple repair for their iPads, but there can be other issues that you experience as a user. But no matter what the problem is, you want to make sure you have it looked at by a trained and certified Apple repair specialist. A certified technician can diagnose the problem, fix it, and have your device back to you before you know it. With a certified Apple repair team looking into your issue, you can have peace of mind knowing that your device will be as good as new when you get it back. So who can you trust to fix your iPad when you need it? When you need your iPad or any other kind of Apple device repaired, trust the professionals of DSR to make sure it gets done. Because DSR is Apple Authorized, we know how to diagnose any problem you bring to us and make sure it gets addressed to your complete satisfaction. Whether you need glass replaced or a faulty part swapped with a functioning one, we will take care of it. As a leading provider of warranty and out-of-warranty laptop, tablet pc and computer repair, we won’t turn any customer away when their devices need repair. Bring us your iPad 2, iPad 3, or any other device you have and let us take a look. We promise you that the problem won’t trouble you again once we finish. You could have your iPad repaired today! Just call (410) 579-4508 or reach us online by clicking here and let us know how he can help. The easiest way to get help? Just drop it off! We’re conveniently located in Hanover, MD. Whether you need repair in Baltimore, Columbia, Towson, Glen Burnie, Annapolis, Laurel, Severna Park, or anywhere else in central Maryland, visit DSR with your device for fast, friendly, while-you-wait service.